On the 27th……….So Jimmy came in from fishing the river this am. Jimmy got a snapper bluefish. Jimmy said that he lost some plastic and then switched over to a harder lure and caught a little blue. We saw it and its teeth outside the shop. Little piranha! Also had a fisherman in this am saying there is a lot of schoolies around right now. He did extremely well this am. And they fishermen that have gotten up earlier than most and have headed down to the jetties and close by the jetties have been do very well on tinker mackerel and clams. Again, with low tide early in the am this week it been a good and productive time to fish the mouth of the rivers. Also, the low tide will soon be at sunset and that will also be a good time to fish the river mouths. 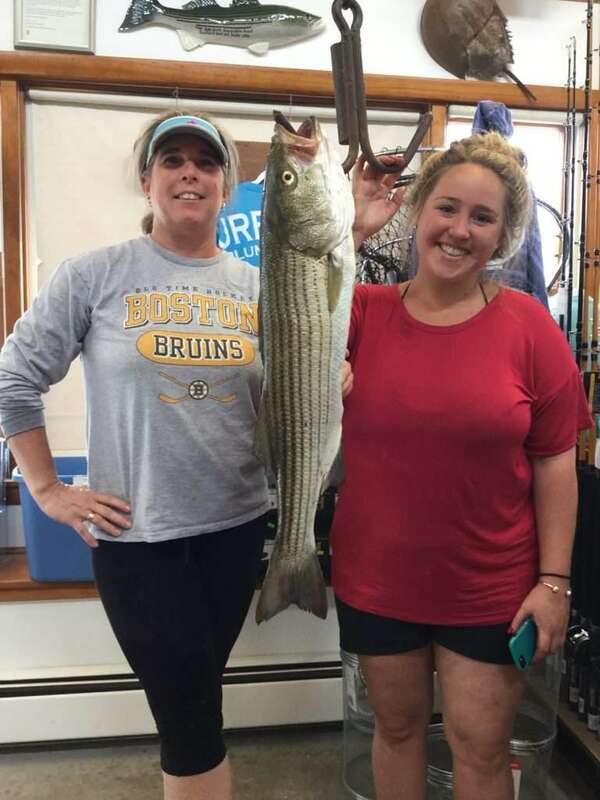 On Sunday, Maria Nixon was kayaking with friend Samantha Philips out around Joppa when Maria hooked into this 9-11 on a tube and worm. For today………..so far we haven’t heard of much. The ran has certainly put a damper on fishing today. But looks like the sun is starting to peak through here and hopefully the afternoon tide will show us some fish. Overall it seems to have slowed down a bit. But i will say the number of people fishing also has slowed down this week. So, without them and there reports to us we don’t have a whole lot to add. Everyone is gearing up for the holiday week coming up. Sorry wish we had a better report! are the pogies around this year like last year.